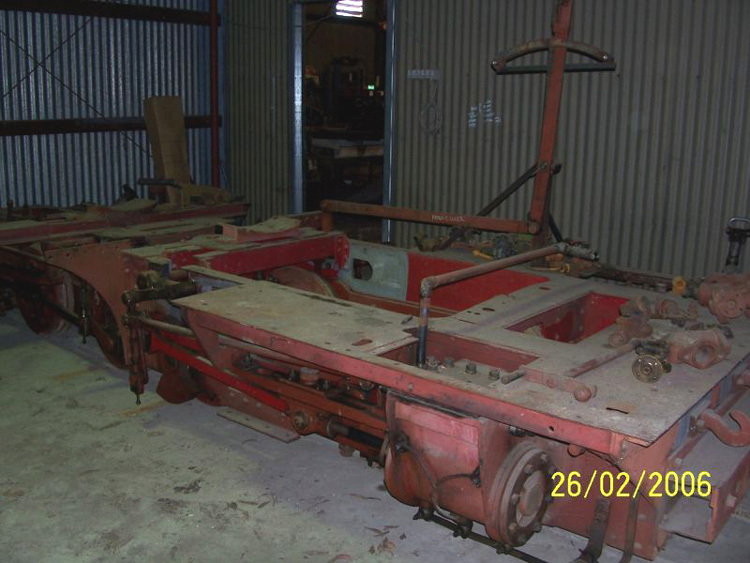 Originally from the Magnet Silver Mining Co.
Russell Dunn kindly contributed this view showing the reconditioned chassis of Magnet No.3 at the Bennett Brook Railway. The Magnet Tramway closed around 1932, with Magnet No.3 having the melancholy duty of assisting with line dismantling around 1940. It was stored until 1946 when No.1 and No.3 were sold to Great Boulder Gold Mines Pty Ltd of Kalgoorlie, Western Australia. Magnet No.1 apparently never worked at Kalgoorlie, instead being used only as a source of spares for Magnet No.3 which soldiered on with gold ore haulage duties until 1962. Fortunately No.3 was purchased for private preservation by WA steam enthusiast Ken Whiteman and moved to his property ‘Whiteman Park’ at Mussel Pool, where it acted as a gate guardian (together with Krauss 2181). This site later became part of the public parkland ‘Whiteman Park’ created in 1978. In 1984, No.3 and Krauss 2181 were gifted by Ken Whiteman to the WA Light Railway Preservation Association, operators of the Bennet Brook Railway at Whiteman Park. Magnet No.3 is gradually being restored to operation at the Bennett Brook Railway. The chassis has been fully overhauled and the boiler is generally sound, but replacement side tanks, cab and bunker await fabrication. The Bennett Brook Railway website features a complete history and restoration summary for this interesting locomotive. In recognition of the significance of Magnet No.3, the National Trust of Australia (WA) presented the WALRPA with a certificate of classification for the Mallet in June 2007. The Wikipedia article describing the patented Mallet locomotive design provides a good explanation of the concept and early designs of the inventor, Swiss engineer Anatole Mallet, together with a history of the type world-wide from prototypes through to the huge US examples. The original Mallet design used compounding, with two high-pressure cylinders attached to the main (rigid) loco frame at the rear, and two larger-diameter low-pressure cylinders powering a swivelling bogie at the front; this design provided a powerful yet economical locomotive that could negotiate sharp curves. By applying the low pressure (second-stage steam expansion) to the pivoted front bogie, the problems of maintain a seal through flexible steam pipe joints was minimised. US railroads were notable users of the compound Mallet type, but most later examples (such as the well-known Union Pacific 4-8-8-4 ‘Big Boy’ and Chesapeake & Ohio Railroad 2-6-6-6 ‘Allegheny’ types) used only simple expansion and thus were not true Mallets. Magnet No.3 represents an early Mallet locomotive with compound expansion, but is unusual in that the rear (high-pressure) cylinders are situated behind the rear driving wheels, rather than in front. Only three Mallets worked in Australia; the two examples for the Magnet Tramway, and a third (O&K b/n 943 of 1902) which worked at Port Douglas in the tropical north of Queensland. In more recent years, a fourth Mallet (O&K b/n 3770 of 1909) was purchased from an Indonesian sugar mill for private preservation in Melbourne, and I believe similar locomotives survive on other Indonesian sugar mill railways. For more information about the various Orenstein & Koppel steam locomotives sold to Australia, refer to ‘Light Railways’ magazine of December 2015 (Number 246) which details all 33 O&K locos which operated here. 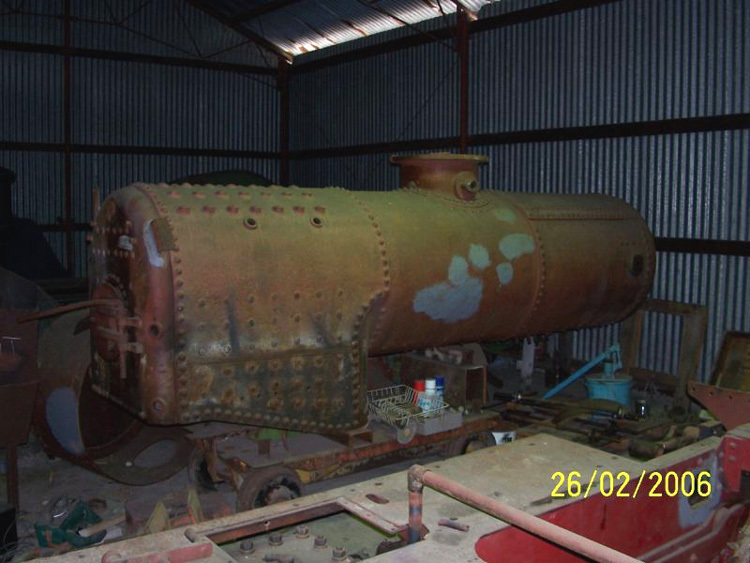 Russell Dunn also provided this view of the boiler, with the chassis in the foreground. By John Browning (pages 3 – 15).